Dash Of Classic: Fairy tale!! 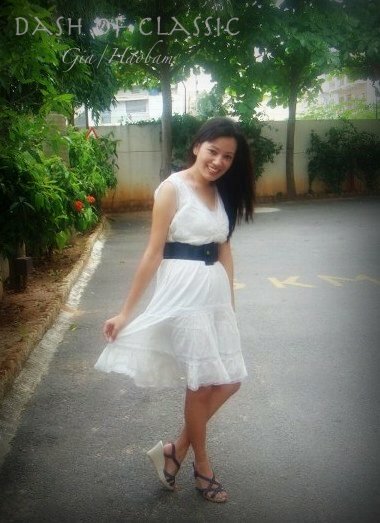 A white dress can be for any occasion, be it that brunch meet up with girl friends or going for a date. I must tell you guys, I have white color fetish as well, there was a time when I just picked up anything which is white, but yes off recent my color choice has improve =) . But any day I can pull off white dress given me any occasion because it makes me look elegant and yet so simple. My father is adorable when it comes to my dressing, he would all the time tell me how beautiful I look in my white dress =) one reason he keep telling me whenever we go out for a party , he just want to avoid all my loud dress when it comes to meeting his friends not that he minds. But whatever it takes, I love my fairy tale ride and the immense pleasure to feel like a Princess …. I should be waiting for my Prince charming (giggle) and would love to tumble over him, fall in love at first glance and then lived happily ever after.